…first, many thanks to everyone for the sweet birthday wishes and support for my fifty for 50. I’m excited about it and I think it should be great fun to share all about it here. I started the day with a walk with vanessa (and holly) in the park. two laps. we hadn’t done that since august and it was delightful to feel the crisp air, see the season and catch up. 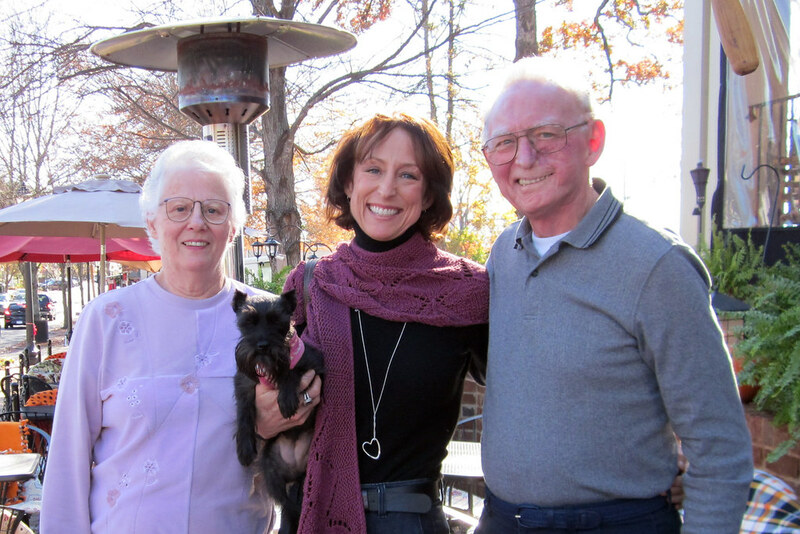 my parents are visiting for thanksgiving and they took me (and holly) to lunch at nine in roswell. we had a great meal on the porch (highly recommend the grilled pimento cheese!) and then a photo. I’ve written about how special it is to spend birthdays with my mom and dad. we think the last time we shared my birthday was when I turned 21. two days before my wedding. wow! lunch was wonderful and then it was off to martha’s for cupcakes and coffee. next a quick stop at the shop for some knitting (finally!) and more coffee. and finally home. I got holly settled (one quick walk, she inhaled her dinner and then zonked on her bed – whew! birthdays are hard work!) and started my birthday for one. gifts, cards, chocolate cake, red wine and a candle. that’s all it takes! … then I skyped with katie. (and ate the cake and drank the wine). enjoyed all the cards and the emails and the facebook and text messages. and went to bed. tired. happy. loved. blessed. grateful. That sounds like my kind of day 🙂 Happy birthday! Here's to a wonderful coming year! I love that you had grilled pimento cheese for lunch! And it sounds like a wonderful day. Alone doesn't mean lonely and you are proof of that with this post. sounds and looks like you had a lot of fun and a beautiful day-looking forward to celebrating again next week! happy birthday again. A wonderful, happy beginning to a great 50th year. Enjoy the journey. PS. Looking forward to sharing bits and pieces with you.